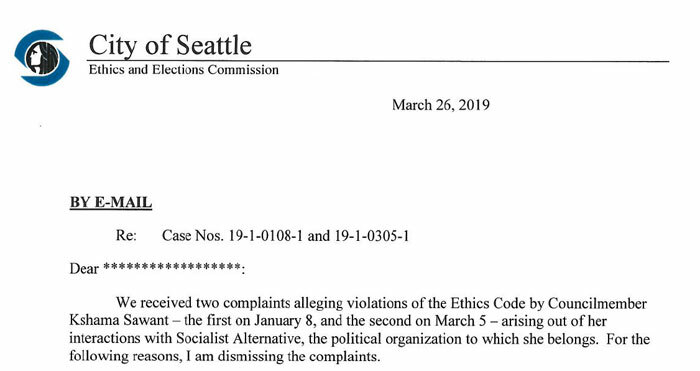 Seattle Ethics and Elections Commission executive director Wayne Barnett has dismissed two ethics complaints filed against City Councilmember Kshama Sawant. A January complaint accused the District 3 councilmember of accepting gifts from her Socialist Alternative (SA) party in the form of paid travel. The SEEC found that SA paid $4,460 for Sawant and her husband to travel to events around the United States and Brazil in 2015, and another $7,180 in travel to Socialist Alternative events in 2017, all of which were documented in the councilmember’s financial disclosure filings. Sawant provided documentation verifying her claim that SA had been paying her travel expenses prior to her joining the council, and also provided three years of travel expenses documentation totaling more than $163,000 provided to multiple Socialist Alternative members. Barnett found that the expenses were customary, and not provided with the intent to influence Sawant’s actions on the city council. District 3 candidate Logan Bowers filed a complaint with the SEEC in March based on an SCC Insight article regarding her working relationship with the party and assertions she makes decisions at the direction of SA’s Seattle Executive Committee. Sawant told the SEEC that she was the one that persuaded the executive committee to side with her when it came to supporting Carmen Best for police chief and dismissing two staffers. “The documents that accompany Kevin Schofield’s SCC Insight reporting support the Councilmember’s claim that she was the driver behind the decision to release the staff members,” Barnett’s dismissal letter reads. The SEEC executive director could not pursue an allegation by Bowers that the councilmember violated the Public Records Act by sharing confidential personnel records with SA, because the SCC Insight article Bowers used to make that allegation only suggested it was a possibility. “This is conjecture, not evidence, and does not provide an adequate basis for me to even demand records from Councilmember Sawant that would show she did not share confidential information,” Barnett writes.